¼ pound bacon, diced – I bake it first in the oven so that it is “done” and browned then I dice it and place in the crock pot. Line crockpot with foil, leaving enough to cover the potatoes when finished – this will help to not stick and to steam the potatoes. 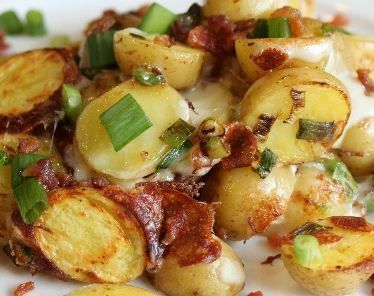 Layer half each of the bacon, onions, potatoes and cheese in crockpot. Season to taste with salt and pepper and dot with (real) butter.